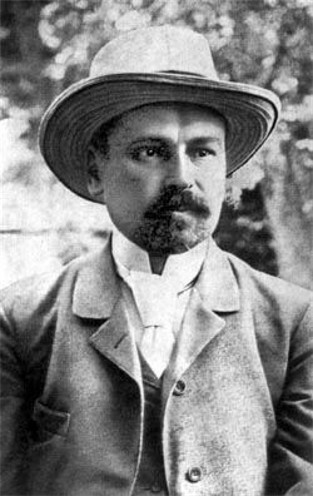 Kotsiubynsky, Mykhailo [Коцюбинський, Михайло; Kocjubyns’kyj, Myxajlo] (pseud: Zakhar Kozub), b 17 September 1864 in Vinnytsia, d 25 April 1913 in Kyiv. One of the finest Ukrainian writers of the late 19th and early 20th centuries. As a child he lived in Vinnytsia, Bar, and elsewhere in Podilia. 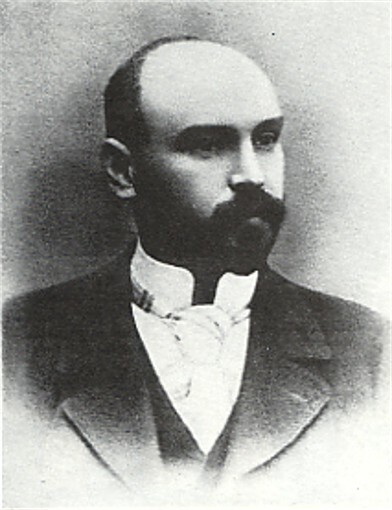 After graduating from the Sharhorod Religious Boarding School in 1880, he continued his studies at the Kamianets-Podilskyi Theological Seminary. Expelled from the school in 1882 for his Populist involvement, he remained under police surveillance for the rest of his life. After his father lost his government job and his mother went blind, he supported his family by working as a private tutor in and near Vinnytsia. A self-taught intellectual, as a young man he was influenced by the works of Taras Shevchenko, Marko Vovchok, Fyodor Dostoevsky, Heinrich Heine, Émile Zola, Victor Hugo, and Guy de Maupassant. His reading of the works of Ludwig Feuerbach and Charles Fourier contributed to his becoming an atheist and a socialist, and Ukrainian literature awakened in him a national consciousness and a desire to work for his people at an early age. 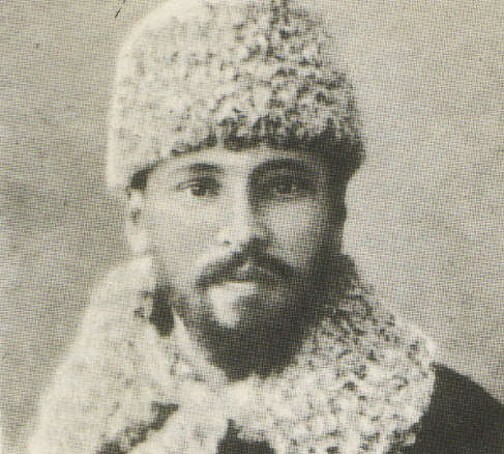 In 1892–7 he was a member of the secret Brotherhood of Taras. 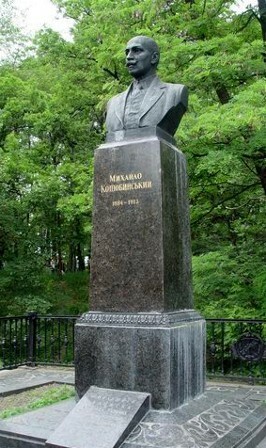 In 1888–90 he was a member of the Vinnytsia Municipal Duma. 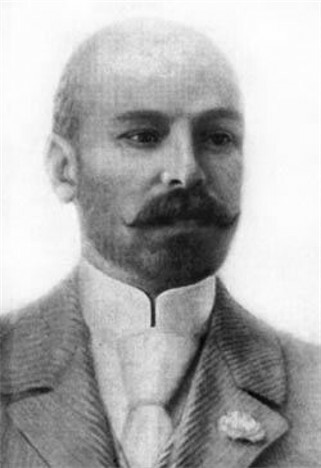 For large parts of the years 1892–7 he worked for a commission studying phylloxera in Bessarabia and the Crimea. In 1898 he moved to Chernihiv and worked there as a zemstvo statistician. 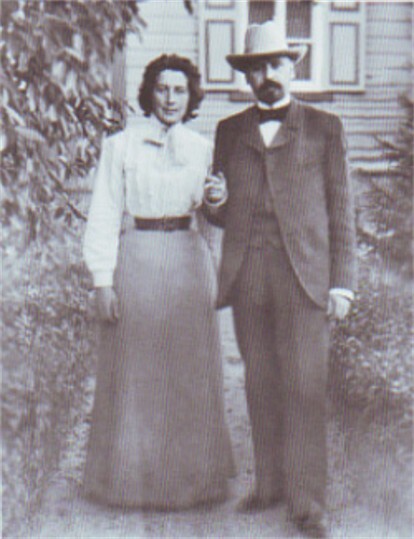 He was active in the Chernihiv Gubernia Scholarly Archival Commission and headed the Chernihiv Prosvita society in 1906–8. 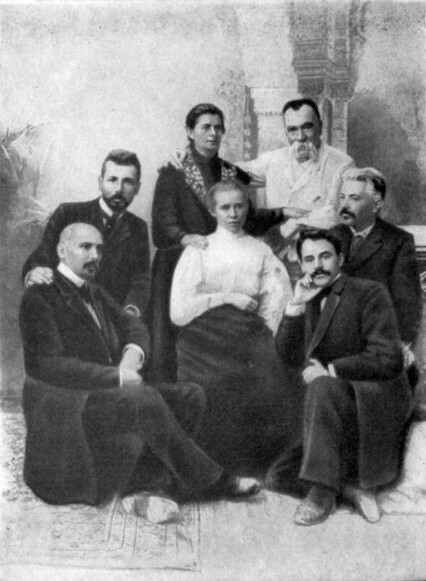 Kotsiubynsky first visited Galicia in 1890 and became acquainted with many Ukrainian cultural figures there, including Ivan Franko and Volodymyr Hnatiuk. 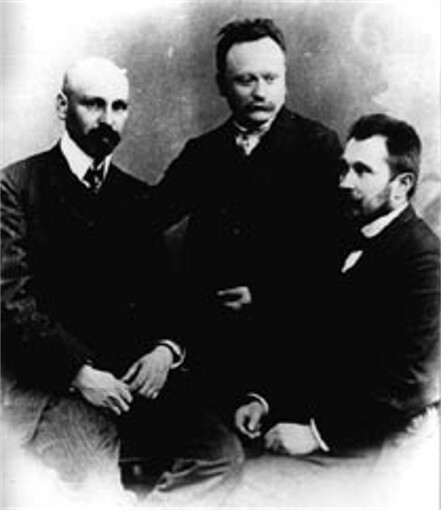 (Photo: Kotsiubynsky with Franko and Hnatiuk.) He maintained contact with many Galician intellectuals and editors of journals, who published his stories beginning in 1890. In 1905 he traveled to Germany, Austria, Italy, Switzerland, and southern France. Suffering from heart disease, he rested on the Isle of Capri in the years 1909–11. He visited Greece in 1910 and stayed in the Carpathian village of Kryvorivnia in 1910 and 1912. 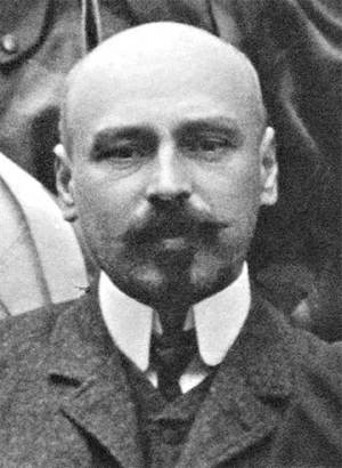 His exhausting job and community involvement made it difficult for Kotsiubynsky to write and contributed to his early demise from heart disease. 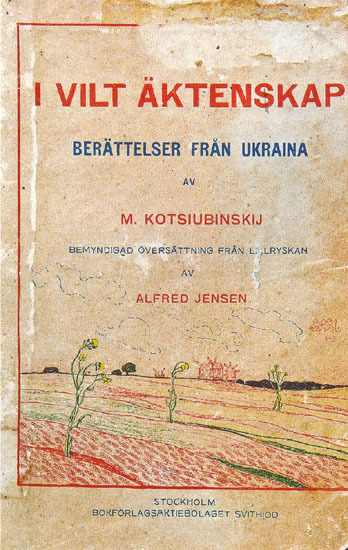 It was not until 1911 that the Society of Friends of Ukrainian Scholarship, Literature, and Art granted Kotsiubynsky a pension enabling him to quit his job, but he was already in poor health and died two years later. About two dozen books of his prose were published during his lifetime, ranging from individual stories to the large collections V putakh shaitana i inshi opovidannia (In Satan's Clutches and Other Stories, 1899), Po-liuds’komu: Opovidannia z bessarabs’koho zhyttia (In a Civilized Way: Stories from Bessarabian Life, 1900), Opovidannia (Stories, 1903), Poiedynok i inshi opovidannia (The Duel and Other Stories, 1903), U hrishnyi svit (Into the Sinful World, 1905), Z hlybyn (From the Depths, 1909), Debiut (Debut, 1911), and Tini zabutykh predkiv (Shadows of Forgotten Ancestors, 1913). 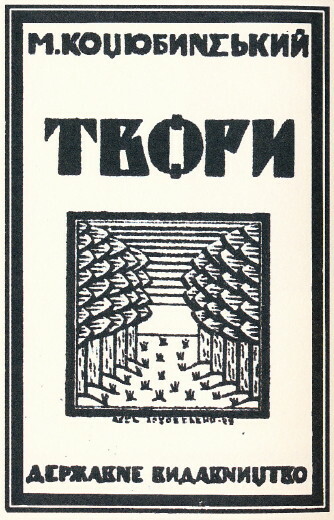 A three-volume Russian edition of his works, translated by Mykhailo Mohyliansky, appeared in 1911–14. Many of his stories were translated into several European languages during his lifetime. Kotsiubynsky's early stories—‘Andrii Soloveiko’ (1884), ‘21 hrudnia, na Vvedeniie’ (The 21st of December on the Day of the Presentation at the Temple, 1885), ‘Na viru’ (A Common-Law Marriage, 1891), ‘P'iatyzlotnyk’ (The Five Zloty Coin, 1892), ‘Tsipov'iaz’ (The Flail Maker, 1893), ‘Kho’ (1894), ‘Dlia zahal’noho dobra’ (For the Common Good, 1895), and others—are examples of ethnographic realism and show the influence of Ivan Nechui-Levytsky and populist ideas. In the late 1890s, however, his themes and subjects became more varied and his approach more sophisticated, and he evolved into one of the most talented Ukrainian modernist writers. Lyrical impressionism was already apparent in his V putakh shaitana, and his ‘exotic études’ ‘Na kameni’ (On the Rock, 1902) and ‘Pid minaretamy’ (Under the Minarets, 1904) are masterpieces of that style. Kotsiubynsky's morally healthy estheticism and abiding interest in internal, spiritual states are reflected in ‘Lialechka’ (The Little Doll, 1901), an ironic depiction of an intellectual disillusioned with the passions of his youth; in ‘Tsvit iabluni’ (The Apple Blossom, 1902), a story about the divided psyche of a writer watching his young daughter die and recording his observations for use in a future work; and in ‘Son’ (The Dream, 1904), a story about a man's escape from the oppressiveness of everyday life into dreams. Subtle psychological realism is also characteristic of the works Kotsiubynsky wrote after the Revolution of 1905. These stories are his most original contributions on another recurring theme: tsarist national and social oppression in Ukraine. They include ‘Vin ide!’ (He Is Coming! 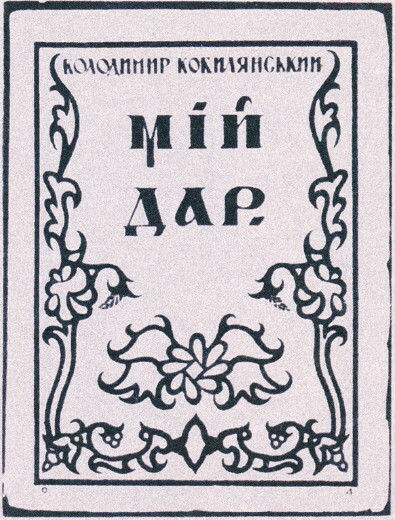 1906), ‘Smikh’ (Laughter, 1906), ‘Persona grata’ (1907), ‘Podarunok na imenyny’ (The Name-Day Gift, 1912), and the artistically powerful unfinished novella Fata morgana (1903–10; English trans, 1976). Kotsiubynsky's most artistic works are ‘Intermezzo’ (1908), in which he depicted, using a combination of naturalism and impressionism, the healing powers of nature for a neurasthenic author, reminding him of his duty to his people; and Tini zabutykh predkiv (1911; English trans, 1981), a psychological novella about Hutsul life that draws widely on pagan demonology and folk legends. 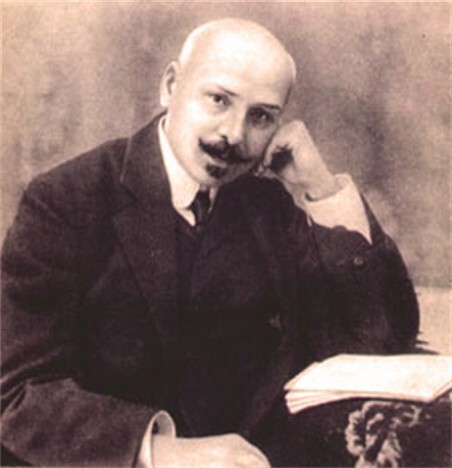 His masterfully written, linguistically sophisticated works had a great influence on early-20th-century Ukrainian prose writers and poets (eg, Pavlo Tychyna). His works have been republished many times. The fullest editions appeared in 1929–30 (5 vols), 1961–2 (6 vols), and 1973–5 (7 vols). Since the 1930s Soviet criticism has promoted a simplistic interpretation of Kotsiubynsky as merely a ‘realist’ and a ‘revolutionary democrat’ and has emphasized his friendship with Maxim Gorky. Several Soviet films have been based on his works: Koni ne vynni (Horses Aren't to Blame, 1956), Kryvavyi svitanok (Bloody Dawn, 1956), Pe-kopt’or (1957), Dorohoiu tsinoiu (At a High Price, 1957), and the acclaimed Tini zabutykh predkiv (directed by Serhii Paradzhanov, 1964). 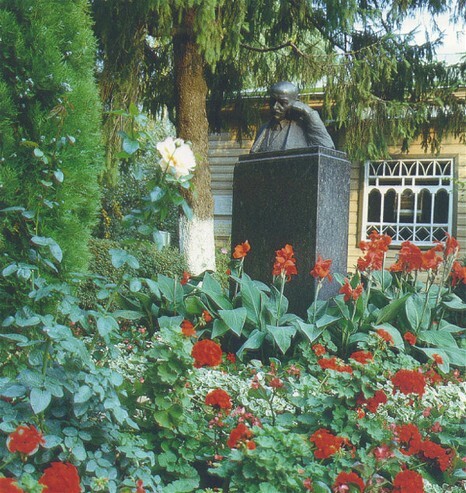 Literary memorial museums were opened in Vinnytsia in 1927 in the building where Kotsiubynsky was born, and in Chernihiv in 1934 in the building he lived in. A referral to this page is found in 86 entries.